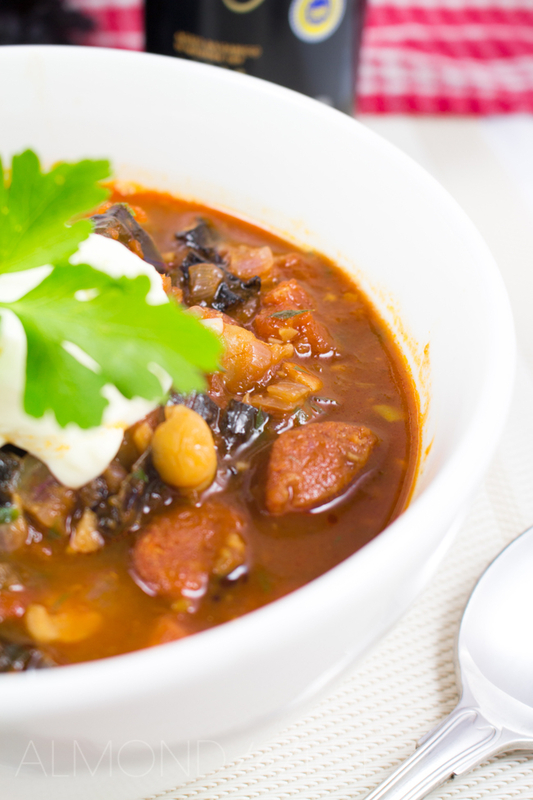 This stoup has been on my list of favorites for quite a while now causes it is quick to make and chock a block with flavor. 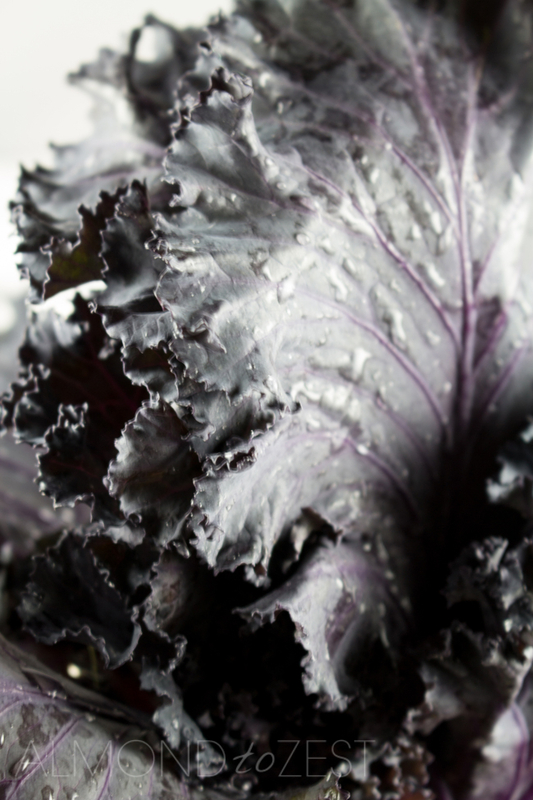 When I first started making this dish it was a little bit different from the version that I share with you today, a little blander and not a piece of kale insight. But as my cooking skills developed over the years so did the flavors of this dish and today my friends I share with you my tastiest version yet. So what is a stoup? And no, the answer is not a spelling mistake, hahaha. It is what I like to call a dish when it is too chunky to be put in the soup category but it is not really a stew either. And this is exactly how I would describe this dish. 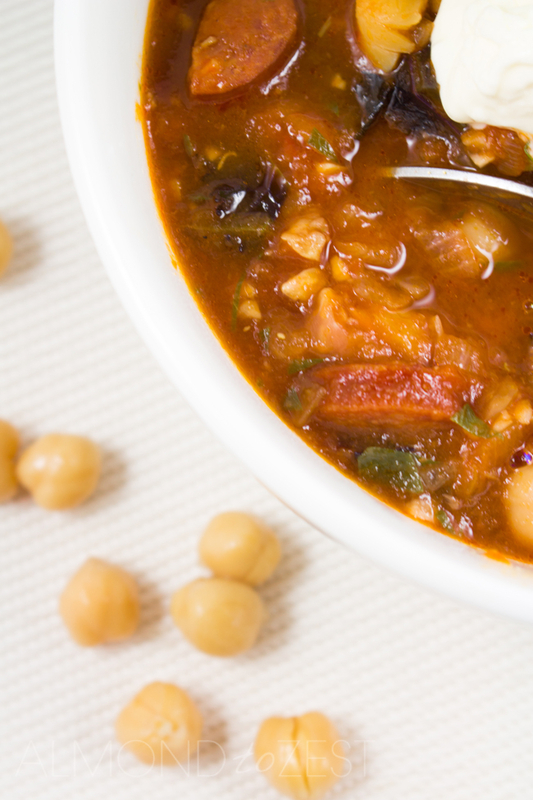 The base of this stoup has a fantastic flavor that you are going to love. The tomato base is infused with garlic, red onion and the smoky paprika flavors from the spicy chorizo. But the balsamic vinegar gives the real depth of flavor to this stoup base. Trust me do not leave this ingredient out. 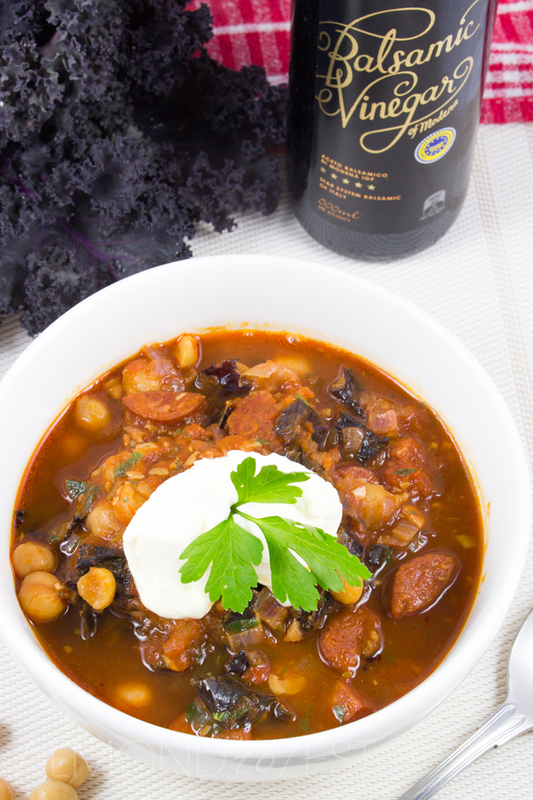 The bulky part of this stoup consists of super cute little chick peas, slices of spicy chorizo and roughly torn pieces of purple kale. These guys combined give a great contrast in flavor and texture to this dish. As I have mentioned before I am a new lover to Kale. Back in the day when Kale became famous I was in a stage of my life where healthy things just weren’t my thing. I used to think what’s the big deal? Why are people raving about this leafy green? Kinda sounds like it’s going to be tasteless and gross. Oh but how wrong was I. Fast forward to today and I now regret all those years that I missed out on eating this miraculous leaf. Now this stoup is sensational by itself, but I like to finish it off by crumbling some creamy feta or grating some Parmesan on top. This time though I had some left over sour cream and added a blob of that instead and it was pretty amazing. The choice is yours. In a medium sized saucepan, cook garlic and red onion in oil over a medium heat till soft. Add chorizo and cook for 5 minutes. Add kale and cook until wilted. Add tinned tomatoes, water, brown sugar and balsamic vinegar. Then add can of chick peas and mix till combined. Season with salt and pepper. Keep on med heat for ten minutes then mix parsley through. Divide into two bowls. Garnish with sour cream/feta/parmesan (optional).